I have a LinkedIn account…now what? a collection or file of documents on the same subject, especially a complete file containing detailed information about a person or topic. 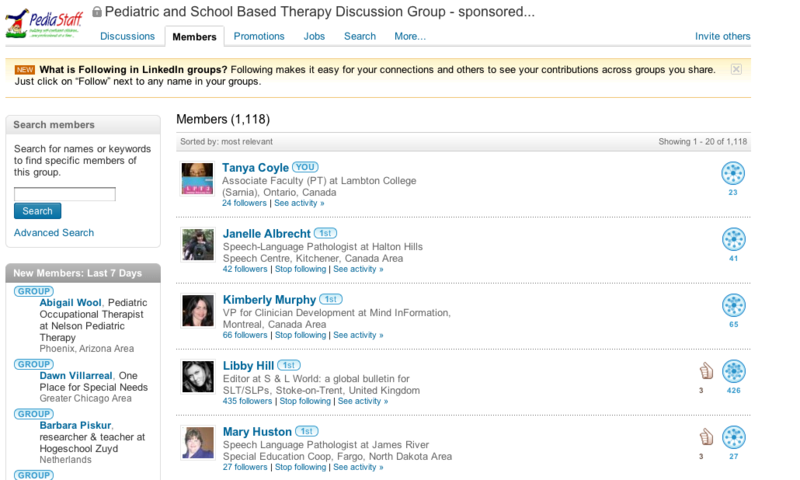 Hopefully everyone has read Mary Huston‘s earlier guest blog post (in my series on social media) introducing you to LinkedIn as a social media outlet for extending your PLN (Personal/Professional Learning Network). She’s agreed to come back and blog some more about LinkedIn and I couldn’t be happier because I learned so much from this post. And that’s not all, she has MORE to share with us at a later date. It looks like Mary’s going to be a semi regular guest blogger here! You’ve taken that first step and actually created a LinkedIn account. Are you wondering what to do next? If you haven’t already, you will want to watch this tutorial of what LinkedIn is all about. The first thing to do now that you’ve joined is to create a profile. A profile enables people to find you and represents you on LinkedIn. The profile also allows you to control your identity online – not just on LinkedIn. For instance, have you searched your name online lately? If not, go try it now…I’ll wait. What was the first item that came up when you searched for yourself? According to LinkedIn, the first search choice is typically a LinkedIn profile (for those individuals who have one). How much easier can it be to have a professional image online? For individuals looking for work or starting in private practice, a LinkedIn profile can be a great source of free advertising. LinkedIn walks members through creating a profile. A 100% complete profile has a picture, a list of current and past positions, education, a summary paragraph, and recommendations from other professionals. Some of this information can be incorporated very easily by uploading a current resume. Each area on a resume: Experience, Education, etc. will have a headline in bold with the information under it. In addition, each section can have a recommendation which will be discussed shortly. 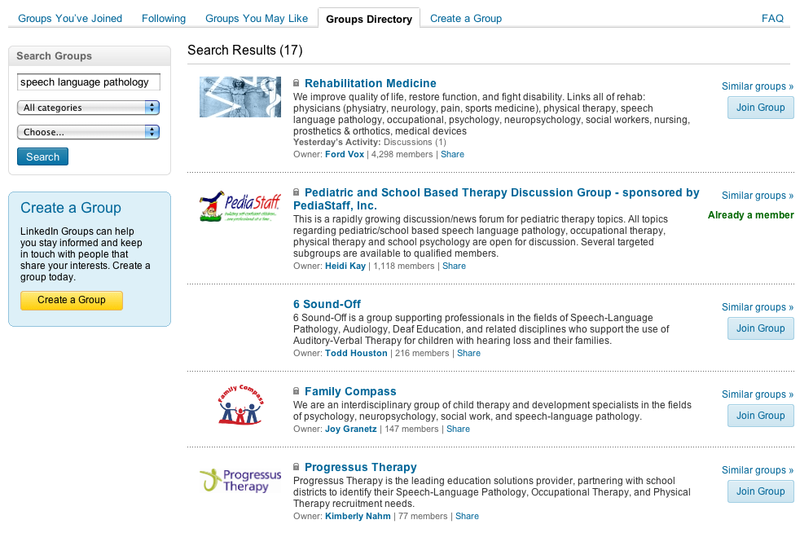 The profile can be customized with different sections (e.g., Presentations, Publications, Websites, Associations, etc.) and to be complete, a profile requires recommendations. A recommendation is a personal statement from individuals familiar with your ability. LinkedIn recommends at least three (3) recommendations to be complete and makes it very easy to request recommendations from people. Of course, more recommendations are always a good thing. LinkedIn has a great profile tutorial that walks an individual through most of the profile creation and makes it fairly easy to create a professional profile in no time. In addition, it tracks how complete the profile is and provides a Percentage Complete so it’s easy to see how much more work needs to be done. When the profile is complete, it can be viewed, emailed, and saved as a PDF file. Once your profile is complete it’s time to start building connections. Connecting can happen in a couple of ways. The easiest way is to look for individuals you know; perhaps co-workers, employers, or friends. There is a search function where if you think someone has a LinkedIn account, you can search for them. Type in their name in the “People” blank and hit enter. A list of individuals who may meet your search criteria is generated. Click on an individual’s name and you will see their profile. You will also see whether or not they are “connected” to you by anyone in your network. Once you’ve found who you are looking for, you have several options. If you are a paid member, you can send an “InMail” which is a direct email. You can ask a member of your network who is also connected with that person to “introduce” you. You can add the individual to your network – IF – you have their address. You will need to let LinkedIn know how you “know” that individual. If you are “connected” to an individual a “How You’re Connected To ____ “ box comes up. This allows you to see how you are connected. LinkedIn also allows you to shop contacts by seeing who else viewed the same profile. The home page is where your personal profile can be edited and you can view other elements of LinkedIn. You are able to see how often your profile has been viewed in the last 90 days and how many times your name has shown up in searches. If you click on the number of times your profile has been viewed, LinkedIn provides a list of people and a bit of their information. If they are in your network, you will see their names and or pictures and which group or connection they share with you. If they are out of your network, you will see a notification that “someone at ____” viewed your profile. If you have a paid account, LinkedIn will provide a list of everyone who has viewed your account. This is a fantastic way to see how effective your profile has been at generating professional interest. The home page also shows Your LinkedIn Network. This is the number of connections you have that are linked directly to you as well as how many people are in your network (connections of connections). This area also provides the number of new people in your network. There is also a box of Jobs You May Be Interested In, which provides job listings. Finally, the home page also provides People You May Know, which are suggestions of different people with whom you may be interested in connecting. 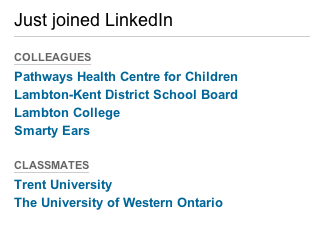 LinkedIn compiles your interests, groups, and profile to generate this list. Now that your profile is complete and you’re able to connect with individuals it’s time to find groups and organizations to connect. Finding groups will be the subject of my next post. In the meantime, go create an awesome profile! 1. a fine point, particular, or detail, as of conduct, ceremony, or procedure. 2. strictness or exactness in the observance of formalities or amenities. 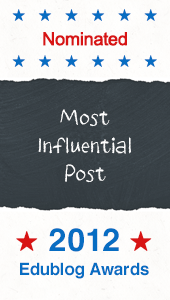 In my series on developing a Personal/Professional Learning Network (PLN) with social media, I’ve discussed Twitter at length because I think it’s the most intricate and misunderstood portion of a PLN. I have described why I love Twitter, how Twitter works, and given you suggestions on how to develop your Twitter network. Today I want to give you some suggestions on etiquette for Twitter. Basically anything that is rude in the real world is probably rude on Twitter. However, I have summarized several things that are more specific to Twitter and may be less obvious. Some of this list has more to do with being rude to yourself than just to others. Also, not all tips are absolutes, only guiding principles so that you’re tweeting with thought and care. It says you don’t care enough to find a pic of something that helps your network get a sense of you and spend a minute uploading it. It causes everyone in your network to be super vigilant whenever they see an egg in case it might be you (if they care enough to bother – they’ll probably just miss a lot of tweets if they follow you at all). It may cause someone in your network to accidentally click a spam link in a moment of weakness because they thought it was from you. It forces people to do extra research into who you might be before choosing to accept you to follow their tweets or deciding to follow you. That’s if they are bothered doing the research at all – most will just not follow you back. Reality Check: Telling a coworker you found a great resource or had a great idea that was actually your other coworker’s resource/idea. When you RT someone, it’s OK to truncate their tweet a bit to make it fit the 140 character rule, but be sure you give credit where it’s due. You can either RT them directly or rewrite the info and add ‘via@tweetname’ at the end of your tweet. It’s also best to credit an online source even if you didn’t get it from Twitter, especially if that source has a twitter account (e.g. newsmedia, bloggers, etc). At the very least, include the link to the info you’re tweeting about when appropriate/possible. I think the reason is obvious but the follow through can get tricky, as it’s not always clearcut and easy to find all the RTs of your tweets that exist. If someone is using a Twitter client instead of the web, especially mobile phone clients, they don’t always let Twitter know and Twitter can’t let you know in turn. The quickest place to find RTs is to go to the web and click ‘your tweets retweeted’ or http://twitter.com/#retweeted_of_mine. If you are using TweetDeck or a similar client, be sure in your settings that ‘don’t show duplicated tweets’ clicked or you often won’t see past the first person to RT you. Finally, I sometimes find RTs I missed by searching for “RT @SLPTanya” in the search field on Twitter Web. Your Tweets Retweeted is still the best way to see them, unfortunately. Just make every effort. Also thank people for giving you a shout out or a Follow Friday recommendation. This falls under the ‘engage in your network’ advice from my tips on building your network. If someone sends you a directed tweet (e.g. they started their tweet with your @Name) or a Direct Message, you should make every effort to respond to them in some way. You should do this even once you have a lot of followers. One of the most fantastic things about Twitter is that it makes other people more accessible, be they celebrities, companies, or regular folks. Really amazing Twitter gurus who have thousands of followers are defined by responding to as many directed messages and tweets as humanly possible. Will you miss people? Sometimes, but it’s the effort that counts. A simple 🙂 will often suffice (if a specific answer was not required). It’s fine to use Twitter to promote your blog, company, and so on, but if you spend all your time promoting yourself, you can get very boring and come off as a ‘bot’. If you spend time promoting others in your network with RTs, shout outs, Follow Friday (#FF) recommendations and so on, you more actively engage in your PLN and come off as an interested and interesting person to connect with. Reality Check: Are you genuinely interested in everything everyone else is Tweeting? Everyone has different ways of following people, and not everyone monitors who’s following them at any given moment (I certainly don’t). If someone doesn’t follow you back, it’s not personal. Give them reasons to notice you and follow you back by RTing them and engaging them with comments on their tweets. Similarly, don’t take it personally if someone stops following you. In fact, sometimes Twitter has accidentally caused my account to unfollow people I’ve been following happily for a long time. And sometimes people stop following someone else for a short time (e.g. if you’re at a conference or tweeting about a topic they are no longer interested in). Along the same lines, I don’t suggest you blindly follow back anyone who follows you. You should develop your PLN tailored to your specific interests and needs. Don’t feel you have to follow everyone and don’t feel that everyone should be interested in your interests. Don’t tweet excessively or with too many tweets in a row. If you regularly post multiple tweets in a row in order to tell a story to all of your followers, consider a blog; it’s a much better format for sharing stories and complex ideas. Likewise, space out information tweets because the same peril may befall you for tweeting many different links in a short time period. People will often skip over your tweets if you do this too often, and then they may miss it when you have something really important or interesting to share or a question they may have been able to answer. I know many people get unfollowed for tweeting excessively because you clog up their twitter feed. 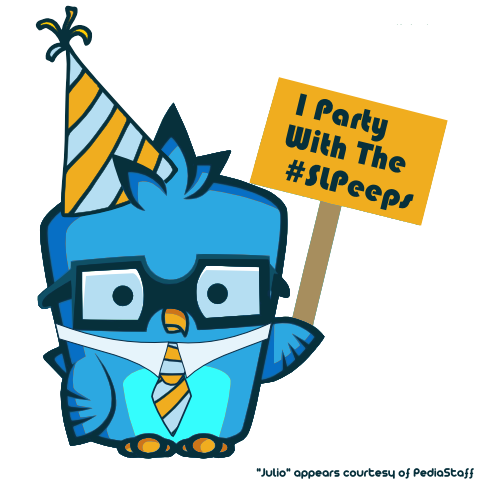 NOTE: I’m adding this post hoc due to some confusion – I don’t mean getting online and responding to multiple people suddenly, I mean posting to ALL your followers EXCESSIVELY in a short period of time (or all day long, as some tweeters do outside of the SLPeeps). It may be broken or otherwise in error. Also, it may not represent your views and then you are, in essence, endorsing it to others. Don’t rely on the caption with the link in someone else’s tweet because it may lead you to think it’s about something it’s not. Don’t tweet anything that can get you fired, get you arrested, upset your mother, or otherwise paint you in a negative light to future/current people in your life. Also, swearing on Twitter is a bit like yelling profanities in a public place. Along with the previous tip, I would posit that it’s rude to yourself to potentially damage your reputation because you fell prey to the ‘anonymity of the internet’. This is obvious if you are tweeting professionally but also make a careful decision about what you say even if using Twitter personally. You never know who will see your tweets (even if they are ‘protected’)! The best thing about Twitter is its 140 character limit. It does pose a problem occasionally, but if everyone began posting longer tweets, it would be impossible to keep up with the information flow. Also, it’s rude to force your followers to constantly click ‘read more’ to finish your tweets. If someone poses a question or comment directly to you and you are responding, it’s more acceptable to go over the 140 limit because it can be assumed that that person is motivated to click ‘read more’. It may even be more polite to any followers who follow you both than to respond in 5 or 6 tweets that clog up their timeline. If you comment on someone else’s tweet, always click the ‘reply’ button. Not only does it save you time by filling in their name automatically, it saves them time and energy trying to figure out what specific tweet you are commenting on. At the very least, include info about referring comment (e.g. re: Frazier protocol convo). If you post a link, always include some description of that link so people know if they want to read more, save it to favorites to read later, or just move on. If you tweet ONLY the link, it’s impossible for them to make that decision (and they’ll probably choose not to bother). I think the reality check says it all. Please use some punctuation (even if we short form words to death) to ensure clarity whenever possible. You know who you are.